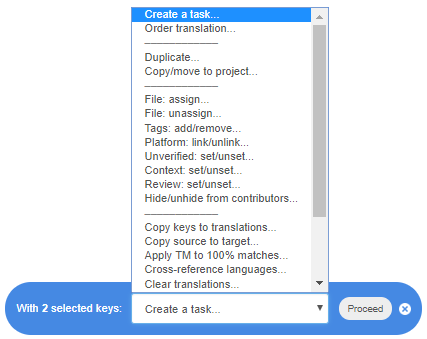 Snappy yet powerful online editor for handling all your translations. The editor is what you see when you open a project. Below you will find a brief summary on the main controls. Each button also has a tooltip, so simply hover your mouse over the target element to see the a short description. Checkboxes: select one, multiple or all keys in the list and perform an action on them. Filter to see only specific strings or keys. Key sorting, e.g., first added or last added. Toggle between multilingual and bilingual view. Bookmark your position in the project. Enable to display placeholders/HTML tags as blocks. Filter: only show keys with screenshots. Add a new language to the project or open the language settings by clicking any language icon. Search keys by the name or a part of the name. Key counter: shows how many keys are displayed using the current filter(s). Add a new key to the project. Find/Replace strings within the project. Magic scroll that helps navigate the keys quickly. Key name, attributes and quick actions. Project related actions and widgets, e.g., manage files and tasks. Use the checkboxes on the left side of each key to choose multiple keys and perform a bulk action with the selected keys. Once you have selected at least one key, a blue floating bar with available actions will pop up. You can go on and add more keys in background before proceeding with the action. To get rid of the bar, simply close it by clicking the X button on its right side. Use filters while editing translations in Lokalise in order to view only the desired strings or keys. 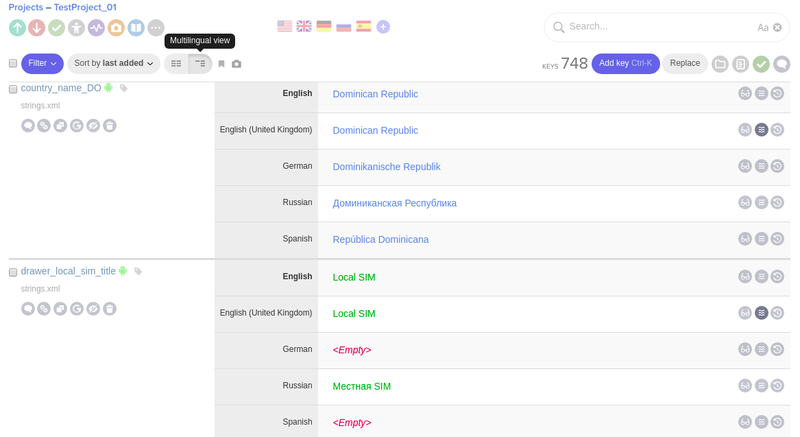 For example, you can choose to see only the untranslated strings or only those belonging to iOS. 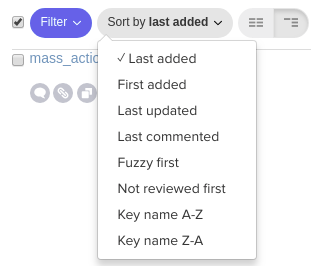 Choose from the predefined filters in the drop-down menu, or create a custom filter by selecting the New filter… option and defining the desired conditions. 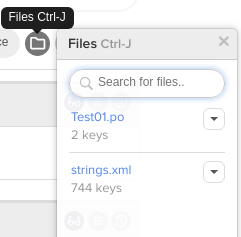 By default, the editor displays the last added keys first. Choose a different criterion from the drop-down list, if required. 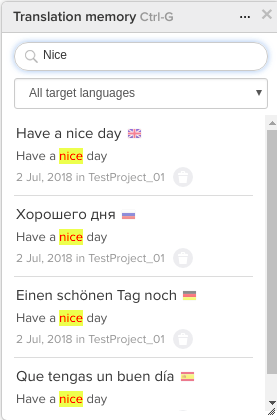 This view is the best option for team leaders and contributors who are working with multiple languages simultaneously, as it offers a unique opportunity to preview and edit translations into all languages at once. 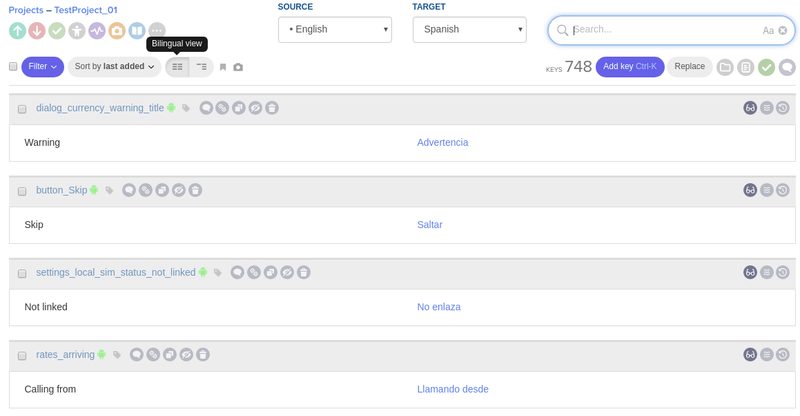 This mode provides the maximum space and lets you focus on the single language translations. You can define both reference language and contribution language from the top panel. In this mode, you will only see the screenshots that have keys linked to them, and, correspondingly, only keys with attached screenshots. Additionally, you can also filter the screenshots using tags. Lokalise supports miscellaneous modifications for the keys. To access the key editor, simply click the key name in the list (on the left side of the editor). 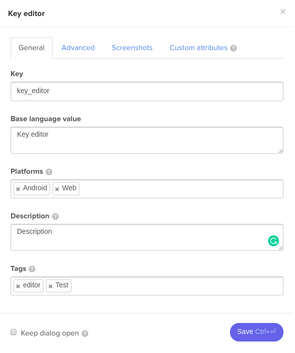 Here, you can modify miscellaneous key attributes, e.g., turn on plural forms, define the the maximum length of the value, or add/remove tags and platforms. Please note that the key editor is only available to project administrators and can be turned off globally in the project settings. Use the Files widget to manage your files. Lokalise has a powerful built-in translation memory, which is shared between all existing team projects and members. Everything that you (or any other team member) type in the editor, upload or set via API, is automatically saved for later use in the translation memory. Once an admin assigns a task to you, it shows up in the Incoming tasks widget. 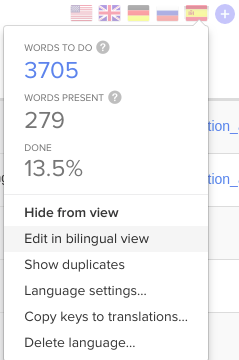 You will see the task title, description and target languages along with the progress statistics. Lokalise offers Slack-style chat with focus on your project. All comments to keys are going to chat feed as well with a link to according key. Just like in comments, you can reply to other users and mention them using @. Enable project chat by clicking chat icon in the top right corner. Each key is displayed in a separate section: scroll down to see more keys using either regular scroll or our magic scroll. On the very left, the key name with all associated attributes is displayed. These include tags, screenshots and quick actions. Hit the platform icon next to the key name to select one or multiple platforms this key belongs to. Clicking the tag next to the key name will apply the tag filter. Add more tags by clicking the tag button next to the existing tags. Simply click the field next to the desired target language to start entering the translation. Use Tab to switch to the next value and Shift+Tab to return to the previous one. Below the textbox, you will find a number of convenient extras, such as autocomplete and character counter. 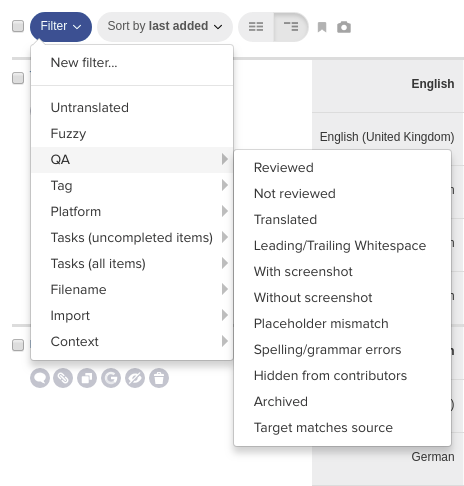 The editor offers free automated translation suggestions from multiple popular machine translation engines. You can use those to help you or order a professional translation from our marketplace. Use the magic scroll on the right side to quickly navigate through keys. You can hover the mouse over the scroll bar to see which key it will lead you to.